It was a third consecutive gold medal for Kenya at the IAAF U20 World Championships on Sunday as Solomon Lekuta won the 800m men's final. 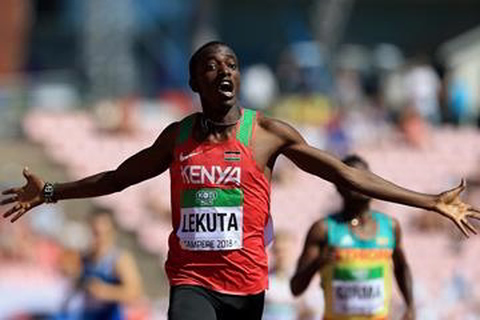 Lekuta showed belief, stamina and speed to overcome the pressure from equally fast competitors to bring Kenyan gold medal basket to six, the most by any country represented at the IAAF U20 World Championships in Tampere. Lekuta took the lead from the start setting the pace for a pack of followers for the first 200m before he slightly dropped behind Ethiopia's Adisu Girma at 400m. Even at this point, there was a horde of athletes who had stuck right in his footsteps. Britain's Markham was one of those who threatened just before he crashed out of the track after colliding his legs to cut short his medal dreams. Ngeno Kipngetich, another Kenyan seemed to be taking over and he was going for gold halfway down the home straight, but he had a rejuvenated Lekuta charging past him from the outside. As he approached the line he took the lead to cross at 1:46.35 beating Kiprotich with 10 microseconds at 1:46.35 to seal Kenya's third consecutive double in the Championships.